Spatulas are great for a variety of kitchen tasks, from scraping the last bit of batter out of a mixing bowl to gently stirring some scrambled eggs in a nonstick pan. 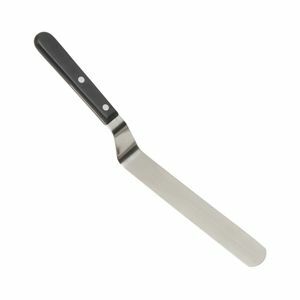 Spatulas can be made from a variety of materials, but your average spatula seems to be made from silicone more often than not these days. There is one exception to this trend and that is the offset spatula, a kitchen tool that is a staple for many bakers. Offset spatulas are long, narrow tools that have a thin, flat metal blade or paddle at one end. The blade is blunt, not sharp, and is used for spreading frosting onto a cake or pushing batter into an even layer in a cake pan. Offset spatulas are handy because they have a large surface area that comes in contact with batter/frosting, etc. This makes it very easy to push that batter around evenly and smoothly. With a regular spatula, there is a risk of jabbing the spatula down into the cake, since usually only the edge easily comes in contact with it. An additional bonus is that they allow you to keep your sleeves out of the frosting when decorating cakes and cupcakes.